A very productive fall fruiting variety with average height canes and average suckering. 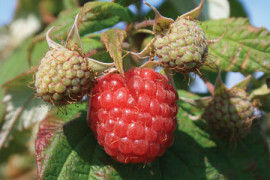 Fruit is very big, very firm and good flavor and of medium red color. Very interesting variety for the size of fruit. Fall-bearing variety, earlier than the Heritage. Very productive and vigorous variety with big dark red fruit and very good flavor. A productive variety with near spineless canes, medium in height with good suckering. 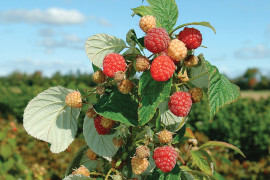 Raspberries are medium in size, medium to dark red with excellent firmness and good flavour. 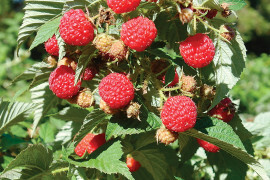 For a summer crop, cut back canes partly after fall fruiting. Primocane variety with high yields. 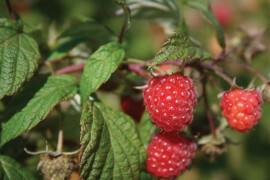 Canes are almost spineless, fruits are large and light red, firm, flavor is aromatic and sweet. Crop earliness is similar to Autumn Bliss. A very productive variety with relatively short, spiny canes with very good suckering. 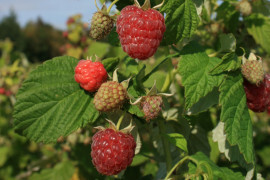 Fruit is medium to large with very good firmness, medium red colour and good flavour. The only fall fruiting variety which fruits throughout August. Primocane variety with very high yields. Canes of medium height that bear large light red and firm fruit. Harvest starts just after Pathfinder and never stops. Excellent choice for tunnel production. 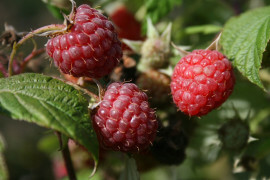 Primocane raspberry of good yielding. Harvest starts after Polana bearing dark red fruits of excellent flavor.